How do I get the best out of my Plinius amplifier? Let your amplifier break in before expecting the best sound. This can take many hundreds of hours before they are fully run in and begin to sound their best. Make sure your mains supply is adequate. Specifically the series impedance (or resistance) of the mains circuit the amplifier is plugged into. In the USA this is more of a problem because of the lower voltage, and higher current demands. The ultimate solution can require a heavy dedicated mains circuit just for the audio equipment, but it is important to consider a few simple factors first. Try plugging the amplifier directly into the wall socket. Power conditioners or multi-outlet boxes can degrade the main supply. Most mains conditioners or filters act in series with the mains and will starve the amplifier and negatively affect the sound. Look for a brand that works in parallel. If you need this treatment to your mains supply, this is a better option for you. Try to keep all equipment on the same phase. This is difficult to determine, so if you suspect your wall sockets may be out of phase, contact a professional that can check this for you. Improvements can also be found if mains circuit breakers and wall sockets are replaced with new components, as this will improve the contacts within the mains circuit. What Loudspeakers should I select? Choice of loudspeakers is one of personal taste, but there are a few simple things to consider in addition. Be certain that your loudspeakers can handle most of the rated output of the power amplifier being used. As a general rule, the use of high power (200 watt RMS or greater) loudspeakers is recommended and desirable with our SA and SB Series power amplifiers. However, our experience indicates that low to medium power loudspeakers (100 to 200 watt RMS) are also quite often suitable for use on all of our amplifiers (including integrated models) provided the volume is maintained at a level where no distortion is audible. Impedance of the loudspeaker load is important to ensure the rated performance the amplifier is delivered. The average impedance load for each channel should be within a range of 4 to 8 ohms. Some loudspeakers can present very low resistances – often less than 1ohm at different frequencies – and Plinius amplifiers are capable of driving speakers that perform like this. What is the Ground Lift switch on my amplifier? This switch allows the signal ground to be disconnected from the chassis. In some installations a hum loop may exist due to duplicate ground paths from different equipment. Use this switch to remove the connection from 0V to earth thus allowing some flexibility in your particular set-up. One position may be quieter than the other. See the section on system noise below. What are AC coupling (or Capacitive Coupling) and Direct Coupling (or DC Coupling)? You may see amplifiers referred to as AC Coupled, or others referred to as Direct Coupled. AC Coupled (also known as Capacitor Coupled) circuits use capacitors to prevent DC from either entering or exiting the circuit. DC Coupled (or Direct Coupled) circuits do not have capacitors, and so very low frequencies including DC may enter or exit the circuit. All of our power amplifiers and also the power amplifier stages of our integrated amplifiers are configured as Direct Coupled. This means that any DC fed to the input will be amplified and will appear at the output. Therefore large amounts of DC are hazardous to loudspeakers and must be avoided. For this reason care must be taken in selecting a companion preamplifier. As Plinius preamplifiers are AC Coupled they block any DC component from being present at the outputs, hence ensuring your loudspeakers are protected. It should be noted that some preamplifiers (such as valve types) and DAC-Preamplifiers may have a DC component at their output. Please check the manufacturer's documentation to ensure your system is going to offer enough protection from DC. Also, you should always turn your preamplifier on first to allow it to stabilise prior to switching on the power amplifier. What Gain and Load settings should I use for my turntable cartridge? The first step is to consult the documentation that came with the cartridge. This will provide information on the output level and the recommended load. Following this, the settings are determined by listening. Set the Gain to an option that suits your listening level. A low output MC cartridge will most likely require a high gain setting but will depend on the gain of the rest of your system. The loading should be adjusted to within the manufacturer's recommendation but again is determined by your personal preference. Select a load setting that provides good clear sound. In most cases the factory 47K Ohm setting is suitable for MM cartridges. How long does it take for my amplifier to 'warm up'? Electronic components must work in their 'linear' range when amplifying music. When switched on from cold the correct point in this linear operating range won't be reached until the temperature inside the equipment stabilises. Once this point has been reached the sound will be at its optimum. In addition we have found that leaving the equipment on for an extended period of time further improves the sound produced. As a guideline you should allow our amplifiers a day to settle and expect further subtle improvements for up to a week beyond this. Is it necessary to leave my audio equipment on all the time? From a sound point of view it can be worthwhile leaving equipment on as discussed above. In addition, with properly designed solid state amplifiers, avoidance of on-off switching will actually enhance the product's life as the stress of the on-off cycle is avoided. Power usage at rest is negligible, typically being no more than a low powered lightbulb per piece of equipment. Of course the SA series Class A power amplifiers should be left in Class AB when not being listened to in order to minimise their power consumption. They may be switched into Class A about 30 minutes before any serious listening session with little sonic penalty. To save power most products feature a standby mode. This allows the circuits to stay active and take only a short time to reach the optimum operating point while using little power when not in use. If you are leaving home for a period of days or weeks, you may wish to switch the equipment off completely. What type of speaker cables and interconnects should I use? There is no doubt there is a difference in sound quality and tonal clarity when comparing different cable brands and types. All we can suggest is that you buy within your budget and use your own ears to determine your preference. Your dealer should be prepared to help with cable selection, and may be able to offer a variety for you to listen to. You may hear differences that are hard to quantify; it is simply a matter of personal preference. For example a silver cable may be more extended in the higher frequencies where a copper cable can seem to have more in the bass frequencies. Good practice is to keep cables as short as possible. Of course this is dependent on your individual requirements, and the quality of the cabling is more important than their individual lengths. Note that for interconnects exceeding a length of around 2 metres you may need to look for low capacitance types to avoid affecting the signal quality. Alternatively balanced interconnects may work better for you over longer lengths, and are designed for this purpose. How do I remove hum from my system? Most audio systems will contain some small residual hum, and very few systems are totally silent. As a rule of thumb hum or buzz heard right up close to the loudspeaker should be lower in level than any hiss present. Also it should not be audible at your listening position. If your system has a hum or buzz that you find annoying, there are a few things you can check to find out whether the source of the noise is electrical or mechanical (or both). ELECTRICAL NOISE: If the hum or noise that is the problem is heard at the loudspeakers when no music is playing then the source of the noise is electrical. In order to find this noise you need to work from the loudspeakers back. A loudspeaker can't generate noise on its own so the first item to check is the power amplifier. Turn off your system and disconnect the power amplifier input cables. Turn the power amplifier back on again and listen. Note that in some cases, checking a power amplifier with no input connected can have the effect of amplifying environmental noise and may make the problem worse. Check the power amplifier with a shorted or muted input to be sure. If the hum or buzz is still present then it is originating in the power amplifier. If it has gone then it is originating somewhere else in the system. In this case turn your system off again, reconnect the power amplifier input cables, then disconnect all of the preamplifier's input cables (from CD, tuner, turntable, etc). Rotate the preamplifier's volume control to minimum. Turn both preamp and power amplifier back on again and listen. If the noise is present now it is originating from the preamplifier, or from the connection between the preamplifier and power amplifier. Try the ground lift switch on the power amplifier, this may resolve the problem. If you have a Plinius preamplifier then try the ground lift switch on that as well. If you cannot resolve the problem at this point it is possible that you have a faulty preamplifier, faulty interconnect(s) or possibly pickup of an external interference such as an RF signal. You may need specialised help to diagnose this. If the system is quiet then you should proceed to connect each source item (CD, tuner, turntable etc) in turn, using the preamplifier, or power amplifier's mute switch each time, and listening for the return of the noise. When it returns you will have identified its source and be able to attend to the problem. If one of your source components (CD, tuner etc) is the cause of a system noise it could be due to a ground loop. This occurs when more than one item in a system has its signal ground connected to the power ground. Circulating currents in this loop can give rise to a hum or buzz. In this case try an isolation device on the power connection of the offending item or you should also try the ground lift switches. Of course good ground connections are basic to any low noise system. You should as a matter of course ensure that your power and preamplifiers are both plugged into the same wall socket. It is important that your CD player, tuner and processor are connected to this same socket as well, even if through a multi-distribution box of some sort. Note that double wall sockets are almost always paralleled together, so using the two plugs on the same wall socket equates to the same ground. DVD players, surround processors, and any device that is connected to a television cable or satellite dish can cause a loud buzz. If by the process of elimination above, you determine a component like a DVD player is causing the hum or buzz to occur, and checking the earthing doesn't remove the noise, you may require an isolation transformer to physically separate the DVD power supply from the mains. You may also find that a balun fitted to your antenna wire could help. If after all this the noise is still present and annoying, it's time to enlist specialised help. You should ask your dealer for assistance. MECHANICAL NOISE: Some items of equipment can directly radiate a mechanical hum or buzz. This mechanical noise almost always originates from the device's power transformer. Place your ear close to each component of your system and listen. If you hear a hum or buzz coming from within your equipment, then the noise is mechanical. 'Lamination rattle' occurs in all transformers to some degree, related to the quality of the transformer and the quality of the line voltage. If the noise intensity varies depending on the time of day, sometimes even the time of month, then it is due to the quality of the AC supply voltage in your area. In this case you're at the mercy of your energy provider. Are RCA or XLR cables better? As with all things in audio, this is largely a personal preference. RCA is often considered a better connection between the plug and socket, while the XLR can be considered a better cable. XLR is a balanced cable and is designed for use in noisy environments or for long cable lengths (over 2m). If you find the noise floor (background noise) of your amplifier is high, try using a balanced XLR cable. Are Plinius XLR connections true Balanced? Yes, all Plinius balanced connections use the +Signal (also referred to as ‘Hot’), -Signal (also referred to as ‘Cold’) and ground. Pin configuration on all Plinius equipment is Pin1: Ground, Pin2: + Signal, Pin3: - Signal. Are Plinius Class A Amplifiers true Class A? Yes, Plinius Class A amplifiers are True Class A bias, but not for the full rated output power. At normal listening levels it is unnecessary to have the full power rating at Class A. To provide Class A performance, but also conserve power, Plinius Class A amplifiers operate in true Class A for Approximately 1/3 of the rated output power. Above 1/3 Output, the bias is technically referred to as High Class AB. For example the SA-Reference will deliver 300W prior to clipping, but only 100W of this is true Class A. For the Plinius Class A amplifiers, what is the rated power in Class AB Mode? Rated output power is applicable to both Class A and Class AB modes. This is the maximum output power capability regardless of the bias setting. 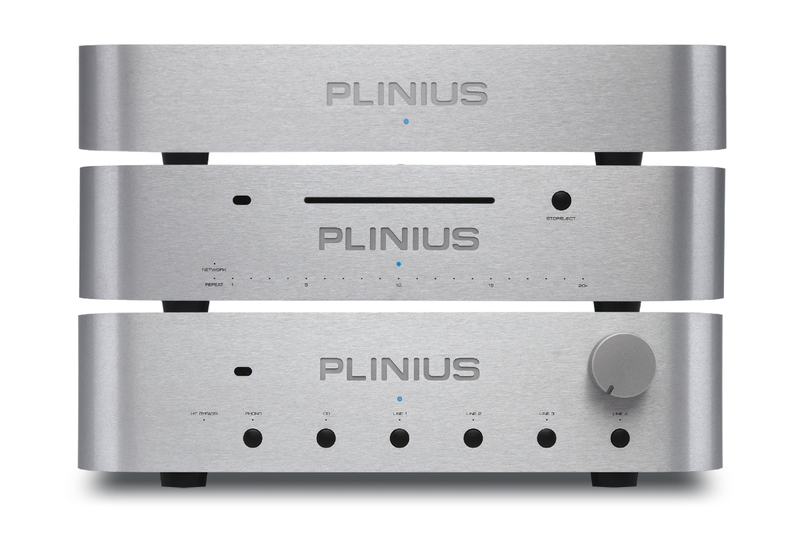 However because Class A is not required at the full output for normal listening, Plinius Class A amplifiers are biased to Class A for approximately 1/3 of the full output rating. This delivers True Class A performance at normal listening levels, while saving power if driven above normal listening. How do I connect to the processor loop of my Integrated Amplifier? The 9200, 8200 and 8150 amplifiers feature a Home Theatre Processor loop so the Plinius may be used for two channel audio as part of a surround sound system. This processor loop allows components connected to the Plinius (turntable, tuner etc) to be the source for a processor, and also components connected to the processor (TV, Blu-Ray etc) to return to the Plinius amplifier. 'Source' is the output from the Plinius. It is equivalent to 'Pre Out' and adjusted by the Plinius volume control. Connect the 'Source' output from the Plinius to a line level input on the processor. The input selected on your Plinius amplifier will go to the processor. 'Return' is the 'Power Amp In' connecting directly to the power amplifier stage of the Plinius. Connect the front left Pre-out and front right Pre-Out from the processor to the left and right 'Return' input on the Plinius. The Plinius will now run the front two channels of the home theatre sound. A switch on the rear panel controls the processor loop. To use the Plinius as the source for the processor, or as a stand-alone integrated amplifier, select 'Bypass'. To use the signal from the processor, select 'Processor In'. In current products the processor loop has been replaced by an 'HT Bypass' Input. How do I connect a sub-woofer? The first step is to consult the documentation that came with the sub-woofer. This will instruct you to connect to the, Pre-Out or Speaker terminals. Pre-Out connections are provided on Plinius preamplifiers and integrated amplifiers for this purpose. How do I connect a headphone amplifier? The first step is to consult the documentation that came with the headphone amplifier. This will most likely instruct you to connect to the Line-Out and will depend on whether the headphone amplifier has its own volume control. Line-Out are provided on Plinius preamplifiers and integrated amplifiers for this purpose.